Picture Book Den: People are watching. Look busy. People are watching. Look busy. I met up with two writer friends before Christmas for our No Office Christmas Party. Of course we talked shop, and all three of us admitted to not being entirely comfortable with the 'online author platform' thing. You're having a Bad Writing Day. ...This is not what you needed to see right now. Everyone and their uncle's cousin’s next door neighbour’s dog walker is busy signing a new book deal, erecting a writing den in the grounds of their manor house, throwing a launch party attended by the literati, selling film rights to Hollywood or collecting the Nobel Prize for Pre-School Literature. Your Bad Writing Day has turned into a Complete Confidence Clobberer (let's call it and anyone who adds to it a CCC) - and it's all thanks to your 'essential' flippin' platform. How come everyone else is in sequins when you're sitting at home wearing odd socks? Are you the only published author who still gets rejected? When will your editor send you flowers just to tell you that you're marvellous? How come no minor celebrities are tweeting selfies with your book? And why, when you're so good at creating a healthy mix of self promotional tweets and silly cat pictures, do you not have three hundred thousand followers? Hang on a minute. As book creators we should know this better than anybody, and yet sometimes we all fall for a bit of smoke and mirrors. You want to know how those CCCs whose book you’ve never even heard of have umpteen followers? They bought them. Ever wonder how every other author has a 'bestseller' under their belt? They don't. They call their book ‘bestselling’ because it's the one that sells the best - ten copies out of the box in the garage as opposed to five from the boot of the car. On the internet, we can make any impression we want. We can appear carefree and successful when we’re close to admitting defeat and applying for a job at ASDA. By cropping a photo we can let people assume hoards of people came to our event when in fact only two did, and they were immediate family. We can make it look like we're busy promoting our titles left, right and centre when we're actually busy dreaming up the next one - a far more important job, in truth. But we shouldn't turn our backs on the internet just because we're having a bad day. The internet is our friend. And our internet friends are our friends. Yes, we're notoriously sensitive souls and it's true that working in isolation can knock our confidence. But in spite of my occasional gripes I find maintaining an online presence overwhelmingly positive. It connects me with the wider children's book community and creates an Almost Office. I genuinely enjoy seeing my friends and colleagues succeed. It's exciting. I know how hard it is to do well at this game, I want to high five other authors way more often than I want to give them Chinese burns. Seeing others succeed appeals to my competitive side. If someone else is doing well, I want to be doing better. Still, I'm happy to admit that I'm not so keen on the CCCs: those who self promote like its going out of fashion, who have only one drum to bang and don't know when to stop banging it. So here's my trick: I don't follow them. They won't mind. For every follower they lose they'll buy another two thousand. Nobody has a Big Bookish Success Day every day of the week. In the picture book world we’re extremely lucky if we have a truly great news day once a quarter or even once a year. 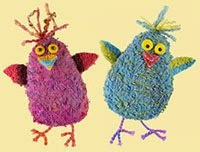 Anybody that looks to be doing much better is either a CCC, is extremely skilled at stringing out their successes or else they’re Julia Donaldson (who, by the way, has almost no online presence and doesn't seem to be doing too badly for it, either). If all your good news comes at once, store some up to release on days when nothing is happening. Stagger reports of events and school visits to cover a greater period of time. If you want to go internet-free for a time while still maintaining an online presence, write draft posts in advance and set auto-publication dates for the future (particularly helpful with known events such as publication dates, World Book Day, National Libraries Day, etc.). Amplify your message by jumping on relevant trending hashtags (if it's #WorldPenguinDay and you have a book about penguins, shout about it using the hashtag). Michelle Robinson has a new book out on January 7th 2016 and she is more than happy to shout about it all over the internet. 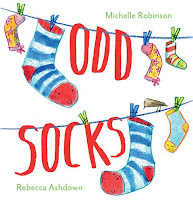 'Odd Socks' is illustrated by Rebecca Ashdown and published by Andersen Press. Great post, Michelle. It certainly struck a chord with me – and I'm sure it will with many other readers. And some great tips and tricks at the end too. Following on from your final tip - CONGRATULATIONS on the publication on "Odd Socks"! Thanks, Jonathan. It's great to be back among such supportive and inspiring company. Yes, welcome back! As with any social gathering, you have to choose your own route through it all, I think. Mention of 'CCC' brought a sudden childhood memory back. We used to rush to grab any 'CCC' fork set on our village school lunch tables. They were thought to be superior to non-marked forks. 'CCC' stood for Cambridgeshire County Council. A bit like all those Twitter and Facebook issues, that childhood 'CCC' issue felt important at time, but, from a distance, is clearly a fuss about nothing! Ha! That's brilliant, Pippa. Happy to have stirred a memory, that's a cracker. I love this post, it really struck a chord with me too! In fact, I have had a bit of a Twitter holiday over Christmas and it has definitely made me feel less inadequate. But I really like your top tips for keeping toes in the online water without dissolving in despair. I think we are really lucky that pretty much all the children's writers I know are hugely supportive of each other and that really helps with the low times. Can't wait to get my hands on Odd Socks - sounds inspired! Whoops, didn't mean to publish that previous post as unknown... I can now reveal my identity! Chortle. Nice stab at anonymity there, Charlotte! Yes, I think by and large we're a very supportive lot - although I've had a couple of unpleasant experiences at writing groups in the past that have put me off for life. Maybe that's a post for another day... or perhaps not. Oh yes! All those 'look at me' posts. I'm not on Twitter except to promote this blog and other blogs I find interesting, and I've been clearing out Facebook 'downer' people recently because it's no fun for me to read their stuff and so easy to get sucked into the comparison game and lose confidence in every aspect of life. The only answer is to secretly block their news! Re: writing groups - I've heard of a few people having bad experiences in local groups and having to leave because they got published. Would be a very good post to do! The dark undercurrent of writing - toxic envy! Having said that, I find children's book authors the nicest of all authors in the main. It's funny, isn't it? Children's publishing is essentially made up of very, very nice people (and the huge amount of support for this post on Twitter yesterday confirmed that), and yet an element of the Green Eyed Monster can sneak in from time to time. I remember feeling pretty envious before I managed to get published. I suppose a degree of that is natural. The mute button Facebook is a godsend. I mostly use it on non-literary folk who share dreadful pictures and inspirational quotes, though! I quite fancy doing a Donaldson sometimes. Thank you! I'm not published but thought I ought to start a Twitter account, adn so often feel all of these things! A good read, thanks. That's good to hear, thanks, Helen. Very best of luck with your writing. Great to have you back, Michelle. On the money (and funny with it), as ever. Thanks, Malachy, it's really good to be back in the Den. No idea what to post about next time, I'll have to set the old cogs whirring... Hope all's well with you and yours. Just about summed up my life. Thank you for sharing. Ah, Billy, you're welcome. The internet is a daft place. Take it all with a barrel full of salt, the real world is the place that matters. Lovely to have you back here, Michelle. I don't so much suffer from the CCCs but instead get REALLY cross when I come across over-publicised books published by well-known publishers that I think are utter garbage (rather than simply not to my taste). Then I snarl, then sulk and then imagine scenarios where the author has sold his/her soul to the Networking Devil or Social Media Ogre. However I'm fine if the book is excellent because then I tell myself it's my fault for not writing it... OK, maybe I do suffer from CCCs!! Lovely to have you back, Michelle. I never get that -I wonder whether I have very different facebook friends (and I don't use twitter yet), but it's not because I have loads of confidence in my own writing. And I have relatively few books out. But I have suffered from pretending that being on line is actually working, whereas I suspect at least 90% of it isn't -for me, at least. I've had an almost total break from facebook for the last three weeks and it feels great. Thank you, Clare. Sounds like you have the balance right.